I would like to share 2 DIY veiners for clay. These are hot glue veiner and clay veiners. I've found that it's cheaper to make our own veiners than buying ready-made one. Also, we'll have flexibility to choose the size and patterns. Honestly, I wasn't the first to find this technique but it works well for my clay flowers. The hot glue technique was mainly used for mold. I think it's suitable only for small leaf or petal veiners. I've recently made veiners from air dry clay. It's very simple! So I thought hm.....I must share this with you. The best thing about this veiner is you don't need to buy special material. It's not a silicon or putty. It's made of something that you've already has it: clay! I started with rolling the clay to a ball shape and change it to teardrop shape and then flatten it with rolling pin. Next, I used clay knife to draw deep line at the center of the petal. And, more lines at both side of the center line depending on the type of leaf or flower petal you want to make. I can't find small leaf from plants or trees around my house but I saw weed at our backyard with leaf size just right for my miniature flowers. It's about 1.5 centimeter length. So I used this for my homemade veiners. First of all, apply a thin layer of Vaseline cream (you can use your body lotion or baby oil if you don't have the cream) on to the leaf. If not, the leaf will stick to the glue. Lay baking paper or aluminium foil on your kitchen bench or work table, draw the leaf and apply another layer of cream on the paper or foil. Heat up your glue gun and pour the glue on to the baking paper. Press the leaf evenly on the glue and leave it for few seconds. 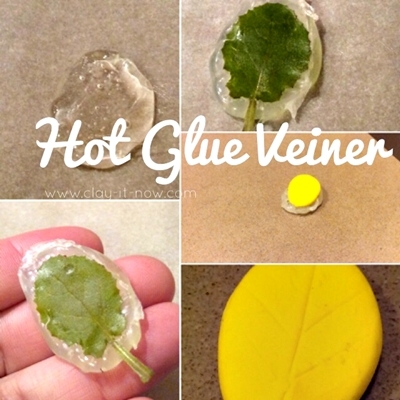 Remove the leave from the glue and you have leaf veiner now. My first leaf veneer with hot glue gun wasn't really good because of the air bubble. But that's okay after few exercises. Honestly, I prefer air dry clay to make the veiners. We would love to hear your experience. Please share your story with us at this page.